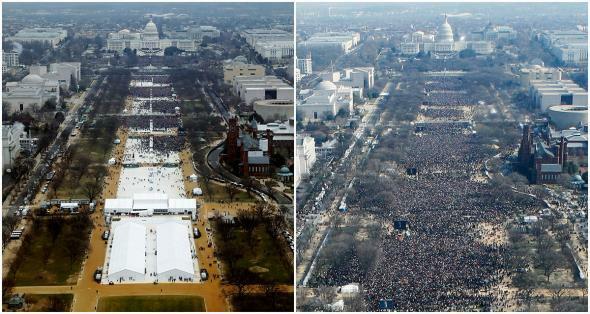 Trump supporters think Trump crowds are bigger even when looking at photos. They still think Trump’s inauguration crowds were bigger, despite the evidence. Here’s why. Which has more people? The answer may not be obvious to everyone. The most frightening part of the otherwise ridiculous story about Donald Trump’s inauguration crowd size is not whether he believes his lie that his crowd was the biggest ever. It’s that a portion of his supporters bought it—and seem to still support it even when directly presented with photographic evidence to the contrary. In the analysis of the research, the authors suggest that Trump supporters don’t actually believe the photo of his inauguration shows more people. “If there were no political controversy,” they write, “any respondent would see more people” in the Obama inauguration picture. Instead, Trump supporters are engaging in “expressive signaling,” where people purposely give the wrong answer as an ideological gesture. There’s actually good reason to think that at least some Trump supporters really do believe there are more people in Trump’s inauguration photo. In the landmark 1956 sociological study, When Prophecy Fails, Leon Festinger, Henry Riecken, and Stanley Schachter join an apocalyptic UFO cult. When the prophesied time comes and goes, the cult members do not lose faith. Instead, they came up with an alternative explanation—God saved the world thanks to their work—and continued to preach their message with even greater vigor. The same thing happened in 2011 with doomsday prophet Harold Camping, whose followers eagerly awaited the end of the world on May 21, despite Camping’s repeated failures in the past. Trump and his vision actually have a lot in common with UFO-enthusiast cults. They’re both charlatans, selling snake oil. His appeal lies in the salvific vision he has sold to his supporters, a compelling narrative of paradise past, the fallen present, and a glorious future. For his followers, it is essential to reinterpret apparent facts so they fit this narrative—otherwise they lose the hope it provides and the dignity they’ve invested in its truth. The process of embracing a charlatan’s empowering vision is not rational, which means that rational arguments are unlikely, in isolation, to dispel it. Studies have repeatedly demonstrated that people cling tenaciously to their worldviews, and conflicting data may actually strengthen their beliefs. (Just look at this family who thinks Trump is “a man of faith who will bring Godliness back.”) To renounce Trump would mean admitting that one’s worldview—of a country wracked by carnage, as the president put it in his inaugural address, and a truth-telling hero who can heal it—is fundamentally mistaken. And that can also mean confronting existential panic without a panacea. It is much easier to forgive Trump for not locking her up than to wrestle with such truths. It’s also much easier to convince yourself that a crowd is larger than it appears, particularly when the man you’ve put your faith in is arguing the same thing. And in the case of the photographs, it didn’t take much to come up with an explanation for the apparent discrepancy. Trump himself supplied it: Mainstream media manipulated both images to make it appear as if Obama’s had more. Trump even asked the National Park Service, which oversees the National Mall, for other aerial shots so that he could better assess the crowd sizes. If Trump is really more like a false prophet than a political leader, we should expect his supporters to deny reality—not for the sake of expressive signaling, but because the coherence of their worldview depends on it. Once a false prophet has succeeded in gathering true believers, even doomsday can come and go without any repercussions, and the size of a crowd is whatever you want it to be. After all, that’s clearly how it works for Trump.